UNLOCK YOUR STUDENTS’ CREATIVITY BRICK BY BRICK! Just another school day? Not quite. LEGO® Education and LEGOLAND® Discovery Centre are working in partnership to deliver high quality educational experiences that will prepare today’s students for tomorrow’s world. 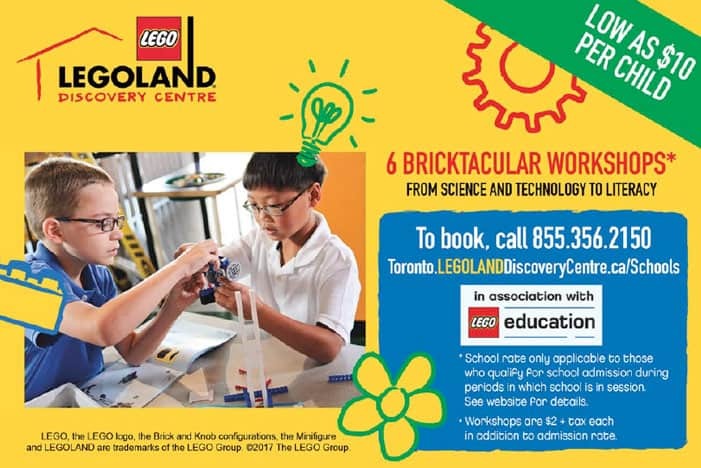 Now educators can discover the learning philosophy of LEGO Education in the thrilling atmosphere of LEGOLAND Discovery Centre Toronto, offering a wonderful balance of learning, creativity and fun. Choose from 6 different educational workshops, ranging from Science and Technology to Literacy. With rides, a 4D Cinema and 3 million LEGO bricks under one roof, the sky’s the limit at LEGOLAND Discovery Centre Toronto!